One of the major points of emphasis for us in the smartphone space continues to be display, as even though you can replace a display on a phone, the only real reason to do so is if you shatter the glass cover of the display. As a result, on pretty much any device it becomes critical to get this aspect of the device right from the very start with little to no end user intervention. Issues like low maximum brightness, poor contrast, poor viewing angles, poor color and/or contrast stability, and all kinds of other problems can severely compromise a smartphone experience. At the high end, there’s increasingly less room for these kinds of issues, especially as companies like Samsung and Apple are shipping almost flawless displays at this point in the smartphone industry. The problem is that it’s hard for people to really agree on what makes a great display at times. Some people want the vivid and colorful display possible, while other prefer accurate color reproduction. Some people want a cold color cast, while others prefer if a display is warm. There are certain performance characteristics where it is obvious that more or less is better, like peak brightness, contrast, color and contrast stability with viewing angles, resolution, and power efficiency. 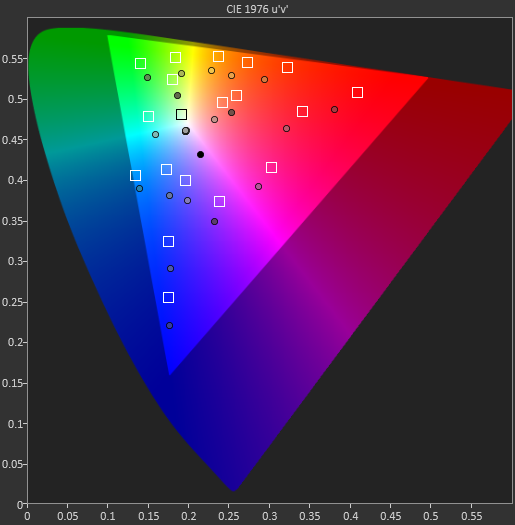 However, for color calibration we elect to test against the standard sRGB gamut with a D6500 white point and power 2.2 gamma as it’s likely that most web content will be targeted to those standards. We will make a reasonable effort to ensure that a display is set to an appropriate mode that would get close to sRGB, but we will continue to draw the line at anything that requires a colorimeter such as an arbitrary color balance and/or gamut slider. In order to measure the calibration error, we use SpectraCal’s CalMAN 5, along with X-Rite’s i1Pro2 and i1Display Pro. In the interest of exploring the G4's display further this time around, we'll also test the G4's display against the DCI gamut. DCI stands for Digital Cinema Initiatives, and this group sets various standards for resolution and color for various equipment in the film industry. This includes a gamut, which is noticeably wider than sRGB, and also has a different white point and gamma standard. As a result, what is accurate for sRGB is completely inaccurate for DCI's gamut and vice versa. 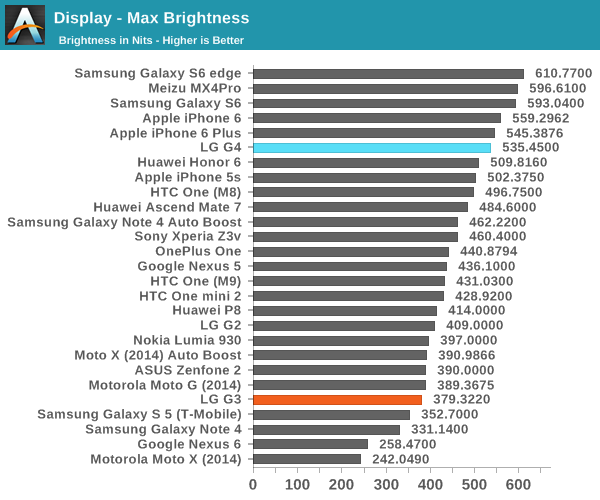 This is done because LG is claiming that the G4 supports the DCI gamut, which is accomplished by new backlight phosphors that allow for more pure red and green light to be emitted from the display. Presumably, because the DCI gamut is used in the movie industry, movies watched on a display supporting DCI gamut will look more accurate. In the case of the G4 though, it's likely that LG wants to really show off the wider gamut that their new LCD can enable, which is why we're seeing an attempt to cover the DCI v1.2 gamut. After all, if they've put the work into a display that can enable wider gamut, it would probably be a waste to then constrain it to sRGB for every shipping configuration. Our first test focuses on simple brightness and contrast at the highest brightness level. 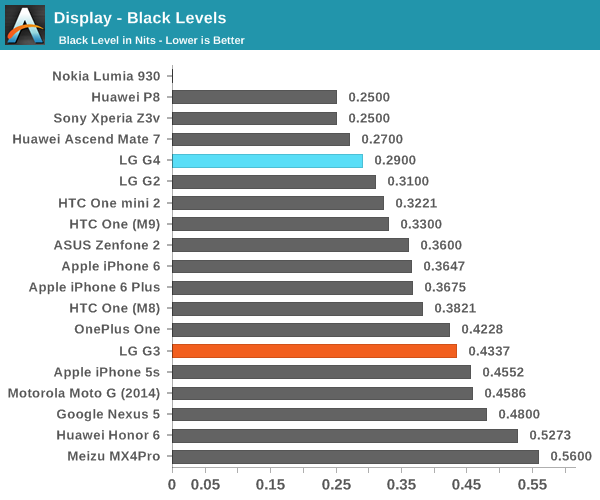 In this test, LG has managed to significantly improve their display over the G3, which puts the G4’s LCD at a somewhat average level for smartphones. 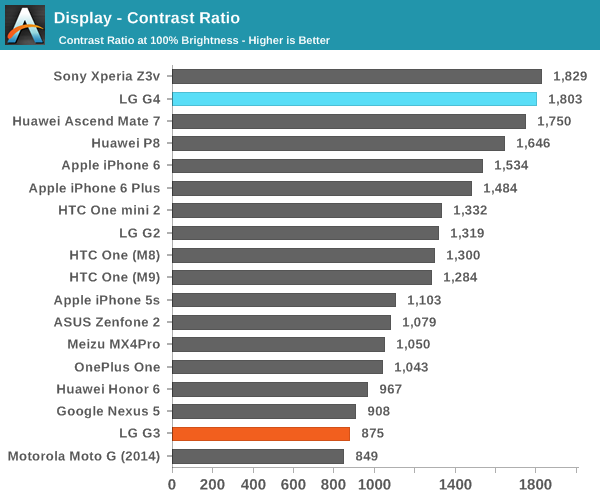 It isn’t quite as high as the iPhone 6 or the Galaxy S6, but given the much higher subpixel density it’s an amazing showing and comparable to other smartphones that have stayed at 1080p. Black levels are relatively low though, and the result is a surprisingly high contrast level for an LCD which remained around the same level even when using APL-constant patterns to defeat dynamic contrast at roughly 1500:1 static contrast. This was probably one of the first things that I noticed when using the LG G4, as the G3 in comparison was far more washed-out in just about every situation. It seems that these improvements have been enabled with the use of photoalignment technology, which shares similarities with photolithography but attempts to induce anisotropy in a photoresist analogue on a glass substrate, which then influences the orientation of the deposited liquid crystals in the LCD. In daytime I didn’t have issues reading the display, although it isn’t as easy to read as the S6’s display with auto boost mode enabled. While we’re still on the subject of contrast and color shifting, in my experience the LG G4’s display didn’t have any noticeable issues with wash-out unless you stare at a black image, and subjectively colors stay true to the eye in just about every viewing angle. The display is also laminated close to the glass, which makes the phone look like the display is painted on when you look closely at most images from extreme viewing angles. LG has also eliminated the rather annoying sharpening effects from the display, which counts as a pretty dramatic improvement in my book for readability as the sharpening effects on the G3 were incredibly annoying with extended reading. Moving on to the grayscale portion of the test, things get a bit less rosy. The G4’s display has a pretty strong blue cast to it much like the One M9, although gamma is relatively consistent if slightly low for presumably better shadow detail. I suspect this is partially done to improve peak brightness output and partially because a segment of end users prefer a cold display, but LG could improve their standing in this test by adding a toggle to set warm, neutral, and cold white points. As the DCI 1.2 gamut needs power 2.6 gamma and a relatively balanced white point, the G4 will have some problems with accurate rendition of grayscale with DCI content. Looking at the saturation sweep for the display, we can immediately tell that the G4 misses the sRGB colorspace. However, the way this is done is rather uneven. On the red and magenta sweep, the color is correct up to 80% and it’s somewhere between 80 and 100% where the display will exceed sRGB. However, colors like cyan and green don’t do saturation compression, so the error from sRGB is evenly spaced. Blue ends up meeting sRGB pretty closely here despite saturation compression, which is an improvement from the significant saturation compression of the G3 display. Unfortunately, the excessively wide gamut results in a relatively average/poor showing in this test. Even when I target the DCI gamut, the issues with gamma and general calibration issues means that the average dE2000 error is roughly double that of the sRGB average dE2000 error at 8.89. 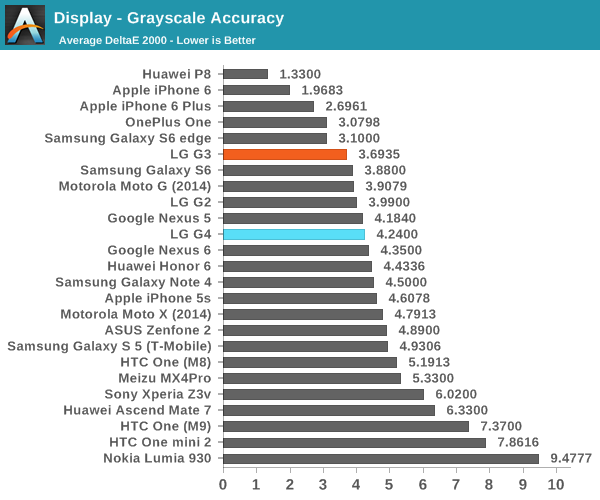 As one might have guessed from the previous two results, the end result for the LG G4 is that color accuracy isn’t quite as good as one might have hoped. 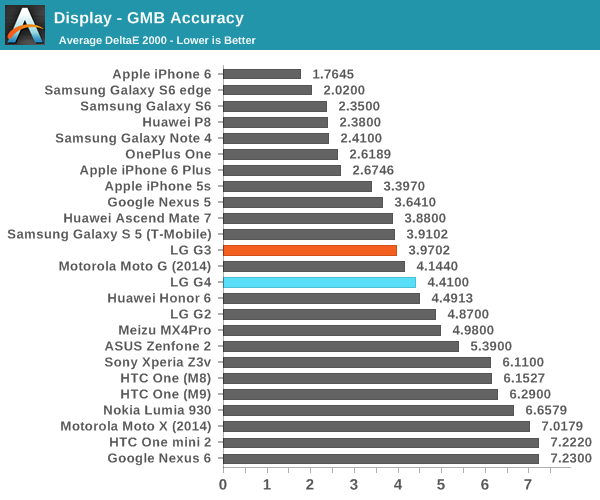 Due to an excessively wide gamut and a cold color cast, the G4’s display ends up slightly disappointing. Even when we target the DCI gamut for testing, the G4 falls short as the calibration is closer to the sRGB settings that we use than DCI with an average error of 9.72. However, the panel itself is high quality given the high contrast, relatively high peak luminance, and great viewing angles. 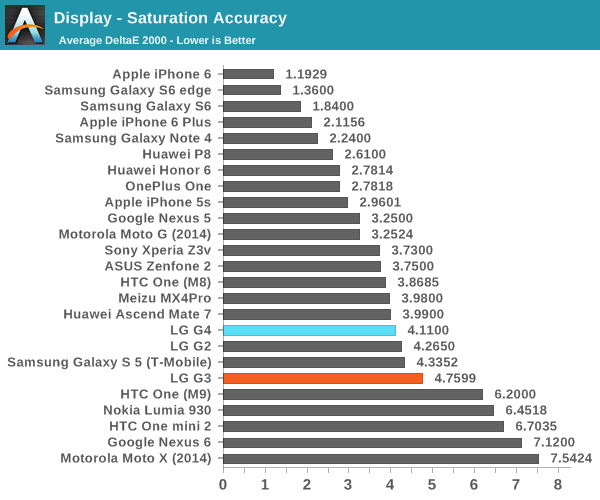 As-is, it’s close to the Galaxy S6 and iPhone 6 Plus for display quality, but falls short due to lack of calibration. 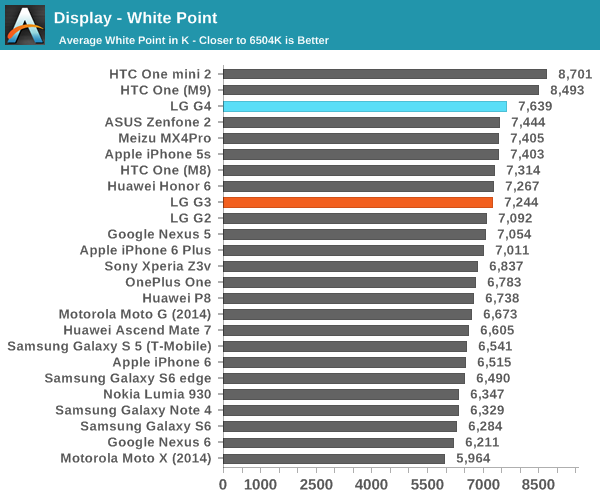 I think the solution here would be for LG to provide an sRGB toggle that would set white point to target 6504k and sRGB colorspace, but this would have to start with the LG G5 as it’s too late at this point to meaningfully change things here.